A packing list is a trade document that identifies details about the contents of a package. A packing list is especially helpful in international trade transactions for confirming the number of items during the transportation stages. Packing list is a shipping document, which is widely used in export and import transactions. Combined with the commercial invoice, certificate of origin and transport documents, packing list is one of the core documents that needs to be created in an international trade operation. The main function of the packing list is to describe the contents of the cargo to various involving parties, who need to know the details of the shipment for different reasons. Packing List Used By Custom Authorities: Packing list is used by custom authorities mainly for inspection reasons. Both export and import custom officers may need a packing list to better understand the contents of the cargo. Packing List Used By Importers: Packing list is used by importers mainly for operational reasons. Importers distribute goods according to the information they have gathered from the packing lists. Packing List Used By Banks: Packing list is checked by the issuing banks under letter of credit payments in order to determine whether presentation is complying or not. Packing lists can be grouped under two main categories: Simple packing lists and detailed packing lists. Simple Packing Lists: This type of packing lists are created with the minimum information provided on the face of the document. 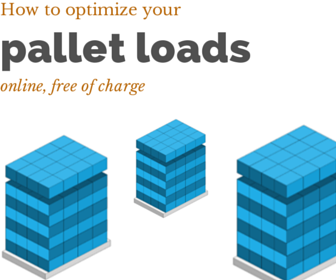 The data stated on the simple packing list is gathered from the commercial invoice and respected transport document such as bill of lading, air waybill, road consignment note etc. Detailed Packing Lists: This type of packing list is created with the maximum information provided on the face of the document. The data stated on the detailed packing list should be covering almost all information provided on the commercial invoice (except financial information) and transport document such as bill of lading, air waybill, road consignment note etc. 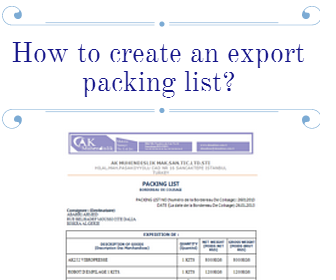 On this page, I would like to show you how to create a detailed export packing list. You can simply delete extra fields of your own choice in order to turn the detailed packing list into a simple packing list format. Step 1 : Adding informative fields to the packing list: Informative fields should explain the seller, buyer, description of goods, delivery terms, country of origin etc. Generally these information should be gathered from the commercial invoice. Seller (Consignor) : Seller is the exporter company. The name and address of the seller must be mentioned correctly. Buyer (Consignee) : Buyer is the importer company. The name and address of the buyer must be mentioned correctly. Description of Goods : Packing list should contain description of goods. You can either show a detailed description of goods on the packing list just like it is stated on the commercial invoice, or else you can keep it in general terms just like it is stated on the transport document. Date: Packing list should be dated. Delivery Terms : Delivery terms, if stated on the packing list, should match the one mentioned on the commercial invoice. Delivery terms generally indicated with the selection of appropriate incoterms, such as CIF New York Port, USA Incoterms 2010 or FOB Hamburg Port, Germany Incoterms 2010. Country of Origin : Country of origin is a critical piece of information and can be affixed to the packing list as well. Some importers and banks force exporters include country of origin on to the packing lists. Commercial Invoice Number and Commercial Invoice Date : Packing list should show commercial invoice number and date. Letter of Credit Number : Packing list should show letter of credit number and any other reference data if the payment method is letter of credit. Step 2 : Adding transportation fields to the packing list: Transportation fields should explain the details of the shipment. Each mode of transport (sea, land, air, rail, multimodal), having different shipments terms, as a result transportation fields needs to be customized in accordance with the mode of transport. Generally these information should be gathered from the respected transport document. Packing List for Sea Transportation: If sea transportation is selected, then a bill of lading should be used as a transport document. Transportation fields of the packing list should be transferred from the bill of lading. Place of Receipt: Place of receipt means the place at which the carrier has contracted to receive the Goods, when such place is other than the port of loading. It should be stated on the packing list, if place of receipt mentioned on the bill of lading. Port of Loading: Port of loading is the port, in which the goods are shipped on board to a named vessel as stated on the bill of lading. Port of Discharge: Port of discharge is the port, where the goods are discharged from the vessel as stated on the bill of lading. Place of Delivery: Place of delivery means the place at which the carrier has contracted to deliver the Goods, when such place is other than the Port of Discharge. It should be stated on the packing list, if place of delivery mentioned on the bill of lading. Vessel: The vessel named on the bill of lading should be written on the packing list as well. In some cases transshipment occurs between port of loading and port of discharge but this will not effect the logic. Packing list should show the vessel stated on the bill of lading unless otherwise required by the sale contract. Container Number: If goods are shipped in container or containers, then each container number stated on the bill of lading should be mentioned on the packing list as well. Seal Number: Each container should be secured with a corresponding container seal and the seal number written on the bill of lading also should be stated on the packing list. Packing List for Air Transportation: If air transportation is selected, then a air waybill should be used as a transport document. Transportation fields of the packing list should be transferred from the air waybill. Airport of Departure: Airport of departure is the airport, in which the carriage of goods by air commences by the first carrier as stated on the air waybill. .
Airport of Destination: Airport of destination is the airport, where the goods are discharged from the last carrier's aircraft as stated on the air waybill. Air Waybill Number: Air waybill number should be mentioned on the packing list in order to create a reference link between the packing list and air waybill. Note: If land, rail and multimodal transport has been effected, you should gather relevant information from respective transport document to the packing list. Step 3 : Adding packing fields to the packing list: Packing fields should explain the details of the packaging. Net Weight: Net weight means the weight of goods only. Number and Kinds of Packages: Total number of packages and the types of packages that have been used should be indicated on the packing list. Once you completed the packing list, you can print it on your company letterhead paper. It would be advisable to stamp and sign the packing list. Make sure to create sufficient number of original and copies of packing lists.